Apparently I got at least two Certificates of Excellence already 🙂 , as I’m told I won two ribbons at CNCH for the shawls I brought.Â I didn’t make it down to the galleries yesterday, but I’m assuming that means “Ocean Sunset” and “Black Jewel” won awards – there was a major flaw in “Lava Flow” that I didn’t bother correcting before the show (had bigger fish to fry).Â The dress is being judged this morning, and I can hardly wait to get the results! The point of going for the COE is not to get the certification; I mean, it would be nice, but I’m not planning on making a living teaching weaving, and outside of that the credential doesn’t matter a whole lot.Â But, weaving 40 samples in such a wide variety of weaving techniques will give me a rough idea of what can be done with weaving, which I think will be helpful to my development as a serious fiber artist.Â Must know what arrows are in the quiver! The COE also contains some basic sections on design, so it overlaps with my needs there as well.Â So I think I will at least work through the samples, and if I pass the examination in two years, great! 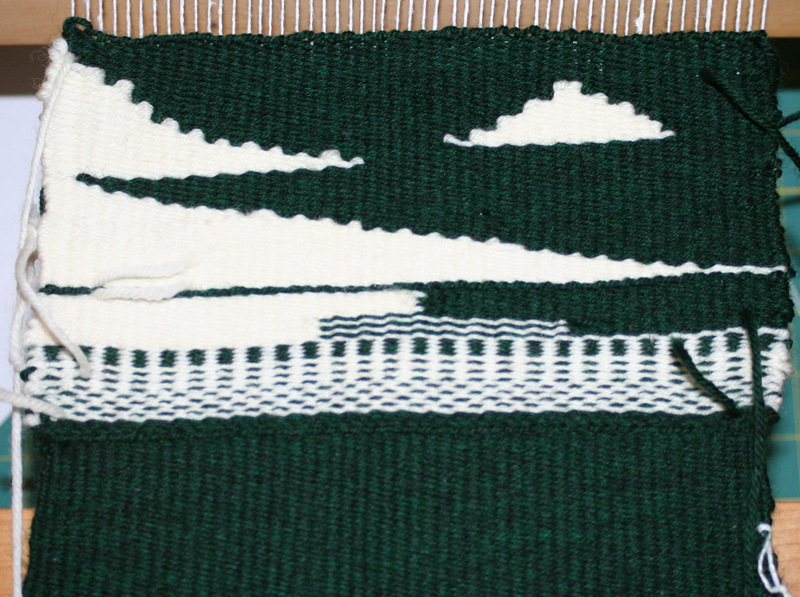 and if not, I’ll still have achieved my primary goal, which is to get a broad overview of weaving. There are alternates to the COE – there’s a Canadian certification that also sounds good, but as the certification requires that you work on a conventional treadle loom for the first few sections, I wouldn’t be able to get the certificate at the end of my study.Â That’s not a deal-breaker, but it is a major consideration, as the piece of paper is nice to have. I’m still considering doing in-depth study on a particular topic instead (most likely doubleweave), and will explore that as well, but as I think about it more and talk to more and more people, the COE is looking like the strongest possibility. Oh, CNCH?Â Yes, it’s been going very well.Â The class I’m taking, “Software, Structure, and Design”, is moving more slowly than I’d like – primarily because I already spent a week or so investigating designing double two-tie unit weaves using weaving software – but today should cover some topics I haven’t already studied, so I’m looking forward to it!Â And the Fashion Show went well!Â I heard a collective gasp from the audience when I stepped out on stage, and collected many accolades afterwards.Â People said it looked fantastic.Â I must confess, though, that I was so nervous I can’t remember much about it.Â But at least I didn’t trip, and it was a fun experience despite the nervousness. But the real fun at CNCH is all the people I got to meet!Â I had dinner with Daryl Lancaster on Thursday night – I’ve been reading her blog for months now so it was nice to meet her in person- and met Robyn Spady, Kati Meek, Joanne and Ed Hall of Glimakra, and oh! lots and lots of other weavers whose names I’ve seen constantly on mailing lists and in weaving literature.Â It was wonderful getting to put faces to names and meet people with whom I’ve been corresponding for months now.Â So I was and am very excited about that. Today I expect to make it down to the galleries at lunchtime, so I’ll be able to get photos of the dress and coat in situ.Â They’ve got a nice display – a small area cordoned off to prevent people from touching it, and a table for my flyers and photo book.Â The dress and coat are displayed on those mannequins I spent so much time making.Â Should look fabulous.Â I’ll also post photos of some of the phenomenal work on display there – photography, fortunately, is allowed in the galleries.Â While I haven’t seen the galleries yet, I saw a fantastic piece of yardage by Lillian Whipple during gallery setup on Thursday, and I’m eager to go back for a closer look.Â Lillian, of course, is the mistress of fine-thread weaving, and she wove up a piece in sunset colors from 120/2 silk.Â It’s like gossamer.Â Must check it out, and the other pieces too!! !